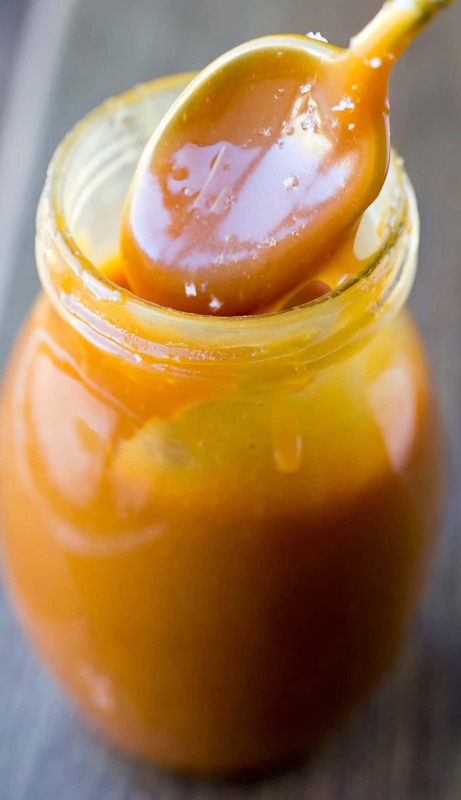 Rich, buttery salted caramel sauce is easy to make with this simple recipe! 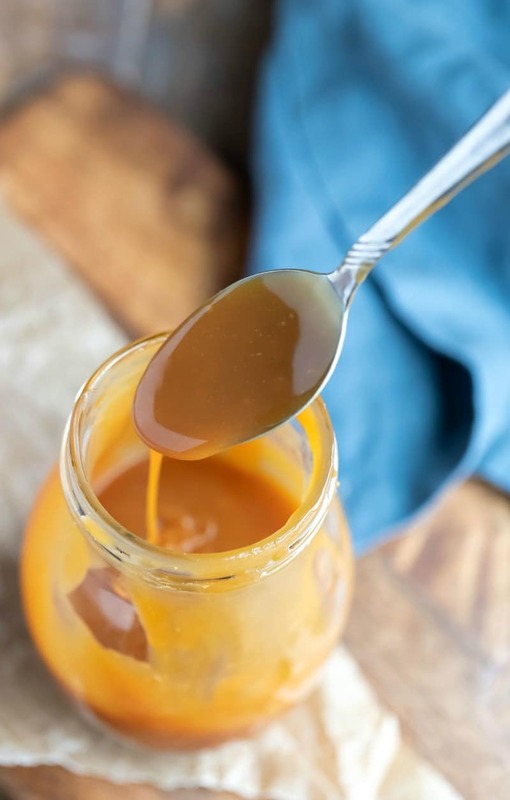 Just a few staple ingredients are all you need to make gourmet caramel sauce at home! Originally published 2/13/13. Last updated 3/14/19. Do you have a food that, no matter how many times you try, just never comes out right? I have couple, but the one that was the worst was caramel. I’ve burned it, and I’ve boiled the water out and been left with a solid clump of sugar. If there is a way to ruin a batch of caramel, I’ve done it – twice. On my 3, 187th attempt, I found a faster, easier way that, best of all, actually ended with caramel sauce. 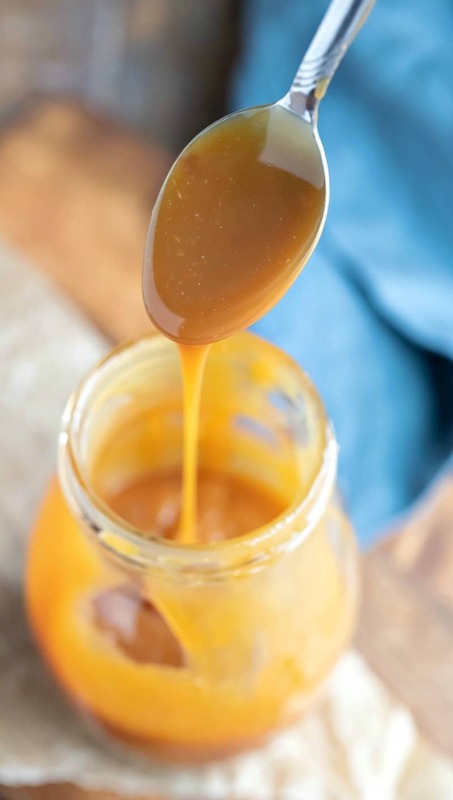 Delicious, buttery, sweet and salty caramel sauce. 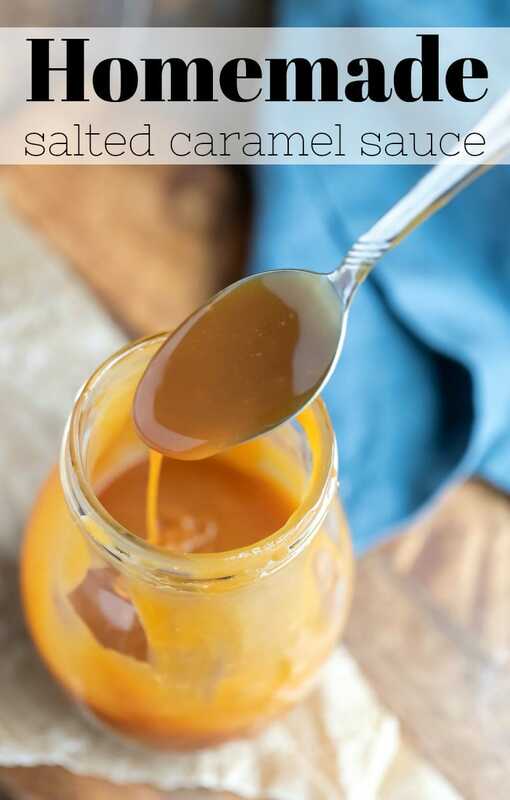 I use this salted caramel sauce in a number of other recipe, but it’s just so good that it needed its own post. Begin by melting the sugar in a heavy saucepan. *Update – After making this sauce many, many times, I’ve stopped using a thermometer. I know that’s pretty much candy-making heresy, but I’ve found that it turns out as well when I just go by the color. I don’t recommend using a dark-colored saucepan because you won’t be able to judge the color of the sugar. Once the caramel is a deep amber color, add the butter to the melted sugar, and whisk in. The sugar can bubble up, so it’s important to use a larger saucepan. Also, it’s important that the butter and cream be at room temperature. Otherwise, they can cause the sugar to seize up. Remove from heat, and stream in the cream, whisking as you go. Add the vanilla and fleur de sel, and whisk in. Let the caramel sauce sit for about 10-15 minutes before pouring it into glass jar. I don’t recommend using plastic as the hot caramel can melt plastic containers. Fleur de sel is a finishing salt that’s used to “finish” dishes. It has larger grains and is less “salty” than table salt. What is a good substitute for fleur de sel? The best substitute will be a good-quality large-grain sea salt flake. Maldon sea salt in one substitute. If you can’t find fleur de sel or Maldon sea salt, kosher salt would be the best choice. Can I use natural (coarse) sugar in this caramel? I’ve tried this with coarser grain sugar (organic and raw sugars), and I found that it didn’t work as well. I recommend using regular granulated sugar for this recipe. Does salted caramel need to be refrigerated? It does. The caramel needs to come to room temperature before being stored in the fridge. The sauce will keep for up to 1 month in the fridge. The sauce will thicken as it sits in the fridge. You’ll need to either set it out to let it come up to temperature or warm it up a bit before use. 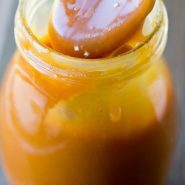 Recipes that use this salted caramel sauce! If you’ve tried this salted caramel sauce recipe, don’t forget to rate the recipe and leave me a comment below. I love to hear from people who’ve made my recipes! You can SUBSCRIBE to receive my latest recipe newsletters or FOLLOW ME on FACEBOOK, INSTAGRAM and PINTEREST for even more delicious food. 3/4 cup salted butter at room temperature, cut into pieces, 12 T.
Pour the sugar into a large, heavy saucepan. Heat over medium-high heat, whisking it regularly. The sugar will form clumps and puddles, but just keep whisking it until all of it has melted. Once all of the sugar has melted, stop whisking it. Keep cooking the sugar until it reaches a deep golden amber color. Watch the sugar closely as it could easily overcook. 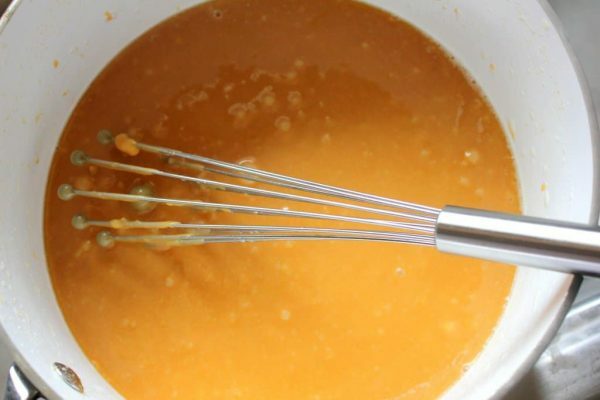 Once the caramel is deep golden amber, add the butter, and whisk until it is completely incorporated. The caramel will bubble up, so be careful. Slowly stream the cream into the caramel, whisking to combine. The caramel will bubble up again, so be careful. Once the cream has been incorporated, whisk in the vanilla and fleur de sel. Let the caramel sit for 10-15 minutes. Pour into a glass jar, and let cool to room temperature (uncovered). The caramel can be refrigerated for up to 4 weeks. Fantastic! This sauce is just wonderful. I can’t wait to try making the caramel frosting. Can I just use table salt? I wouldn’t recommend it. The fleur de sel has a larger salt crystal and isn’t as salty. So, the salt doesn’t make it taste “salty”; it just makes it taste more balanced. If you can’t find fleur de sel, kosher salt would be a good sub (and it’s good to use in a lot of other recipes). If you do decide to use table salt, start with significantly less and add to taste so that you don’t end up with salty caramel. Ok. May just leave out the salt and just get the caramel buttercream. I plan on making 48 cupcakes so will 1 batch of the caramel be enough? Yes, one recipe of salted caramel sauce will give you more than enough caramel for a double recipe of caramel buttercream. What is fluer de sel? Fluer de sel is a flaky sea salt that’s used for finishing dishes. It’s less salty than table salt and has larger salt crystals. Thank you for this recipe! The caramel sauce is just lovely and nicely balanced. I used it to make your salted caramel buttercream (which was a HUGE hit on my gluten free chocolate cake) and now I have a whole jar of the sauce leftover. I was just wondering if you had suggestions on what I can use the sauce for. Will it freeze? Could I use it in something that might have a longer shelf-life/be freezable? I’ve never frozen it, but I have a couple recipe suggestions. Samoas Chex Mix and Salted Caramel Apple Cheesecake Chimis are both family favorites. This sauce us ahhhhmazing!! I’ve made this so many times along the salted caramel buttercream. Thank YOU! Thank you so much for your kind comment! I’m really glad that you enjoy the sauce! would flaked salt work vs. the Fleur de sel? I haven’t tried flaked salt, but I would guess that it would work. Now to try your chocolate cake recipe!!! Thank you for the laugh! I’m so glad that you and your husband like the caramel sauce!!! I’ve been there! 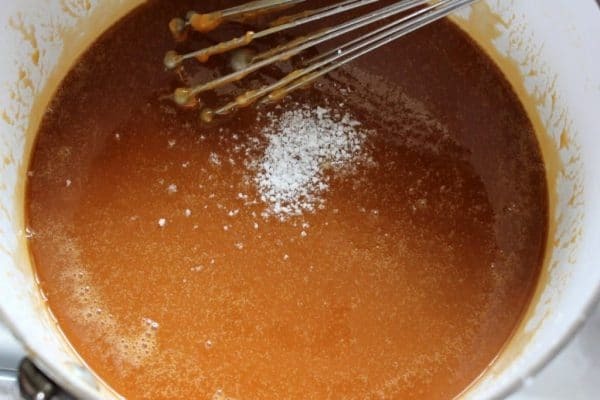 Before I made this caramel sauce, I tried some other recipes. I ruined a pot, melted a spoon, and had to throw away more burned sugar than I would like to remember. Felt like this was to much butter. Did yours seems really runny? Great flavor though! I appreciate you sharing it. I’m sorry your sauce was runny. No, I can’t say that I’ve had that happen. When the butter is whisked in, it always incorporates itself into the sauce. The sauce does thicken as it sits, though. So, hopefully, it thickened up a bit for you! I just tried making this, and have found it doesn’t taste sweet. I used a candy thermometer, but do you think I could have over cooked it? I’m sorry that it didn’t taste very sweet to you. What did it taste like? I’ve gotten distracted and had the sauce end up well done. Mine had a pretty distinct bitter taste to it when that happened. It may have also been because of the amount of salt in the recipe. This sauce is more of a salty/sweet caramel. Since I’ve gotten used to this caramel, I find that a lot of other caramel sauce taste sweeter than this one, so it could be that, too. Thanks for responding, it was definitely bitter, I probably had the heat too high and didn’t get it off fast enough! I’ll try again! :) Thanks! It makes about 2 1/2 cups of caramel sauce. Is it hard when room temp? Or is it still liquid? I have been looking for a nice salted caramel recipe for a while and this was perfect! Absolutely delicious and so easy to make. Thank you for sharing!! I just made this and it was to die for:) I kept eating the caramel sauce with a spoon! After a series of caramel flops I finally conquered a fan favorite! I have to challenge myself to stop eating it all so I can make icing! Thank you for providing me with a recipe that I will use from now on! Been doing this for years! My mother taught it to me! Unopened can of condensed milk + 8 hours on low (completely submerged in water) in the crock pot + cool down in the fridge = Caramel! This is the best caramel I’ve ever had, let alone made! It’s so easy! Need to try this! Fleur de sel is a flaky finishing salt that is sold in many larger grocery chains, specialty stores, and online. It isn’t as salty as a normal table salt would be. Since you’re adding the salt in at the end, you could try fine sea salt or Kosher salt, which I think is a pretty common substitute for fleur de sel. If you go with the fine sea salt (or even the Kosher salt), I would start by adding 1/4 teaspoon and then taste it. It you want a little more salty bite, I’d add another 1/4 teaspoon, taste it again, and then go from there. Hope that helps! Good luck with the caramel sauce, and let me know if you have any more questions!